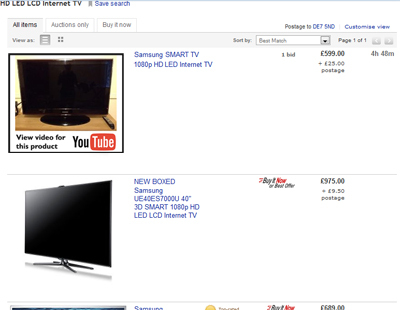 If you’re selling an item on eBay, think about filming a video of the item with and uploading it to YouTube. Most mobile phones have a camera and it doesn’t take long so it’s achievable. A video shows everything is in working order and helps unload the burden of proof on you as the seller. In this example I’m using a TV, but you may consider using video for just about any product you want to demonstrate to buyers. Providing “evidence” can ease the mind of your potential buyer, build trust and help you stand out from others selling the same item. 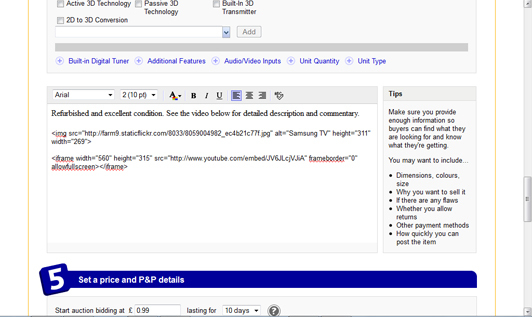 YouTube videos can be set to private and embedded in the HTML area of the eBay listings editor. It may sound like a lot of work but think of it as caring about your customers. The image you upload for your item should also be designed in such a way to let people know there is video content describing your item. 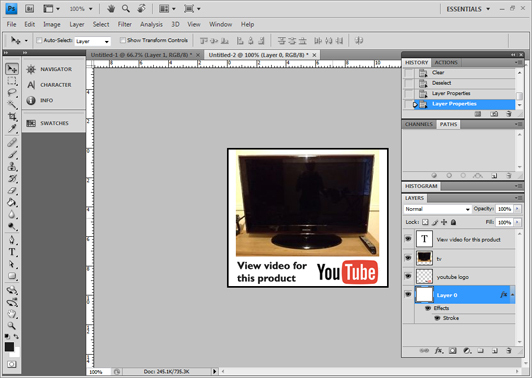 All you need is Photoshop, Gimp or Paint, and with some basic skills you can create an eye catching mini advert. Do not spend too much time editing your video. It should be a case of aim, shoot, talk. These mini videos can be deleted once they have served their purpose and the product they advertise has been sold. If you’re selling lots of the same products feel free to create one amazing video and use it many times. Windows Movie Maker is free if you want to add extra audio tracks, effects or transitions. I filmed a video using my LG KU990 camera phone and then converted the.3gp files to .flv format. Some cameras allow you to transfer the digital file directly from the camera to YouTube’s server. Once uploaded to YouTube, the video embed code can be copied by clicking the share options under the main video. You’ll need to embed this video code into the eBay HTML editor. 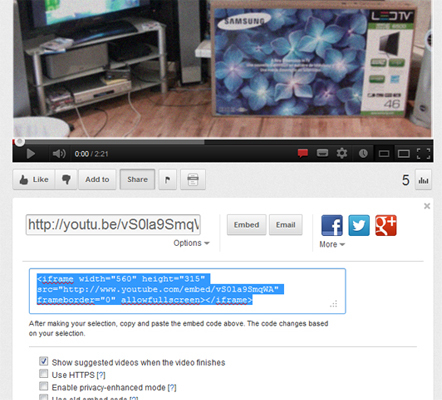 You may find the YouTube iFrame embed codes do not work in the eBay editor. Use the HTML code instead, known as “Old embed code”. You might have to experiment here since things like this are always being updated/changed. eBay lets you upload one image per listing free. But if you want to add additional images use a free image host such as ImageShack or Flickr and just embed these image into the eBay post editor. 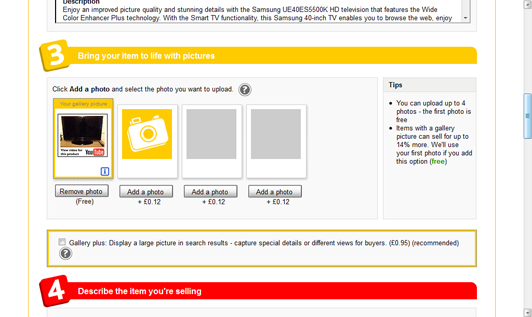 This way, your pictures show up in your eBay product listing and you will not have to pay extra to use eBay’s in built photo gallery. 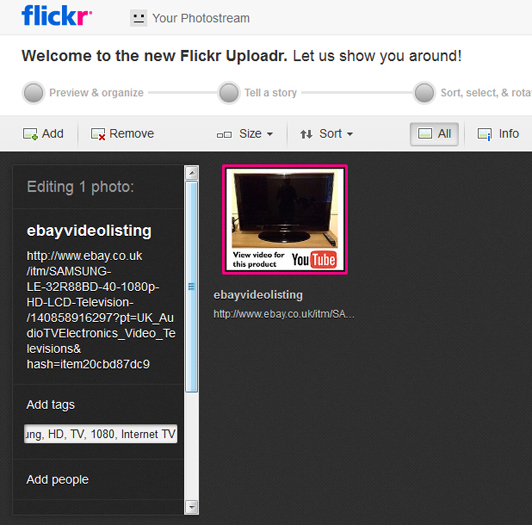 The Flickr image uploader is shown below. 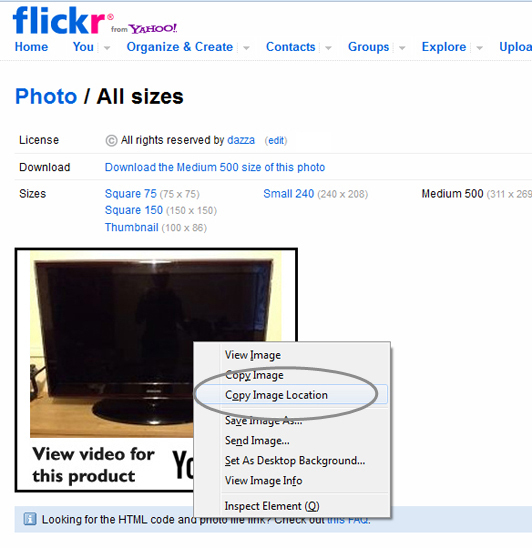 Once your Flickr image is uploaded, right click the image, choose to view a larger size, and get the image URL by clicking “Copy Image Location”. This varies accross different browsers. If you view the image info, you can get the dimensions as well as the URL. 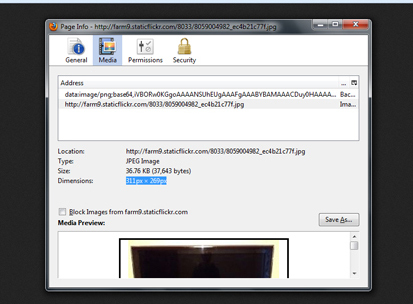 This data is useful for writing your HTML to display the images in the eBay HTML editor. Make a note of the image dimensions. 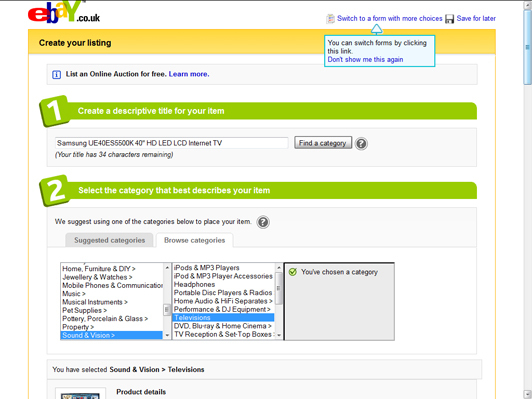 Now, create your product listing as you would normally. Add the YouTube branded image you created advertising your product. 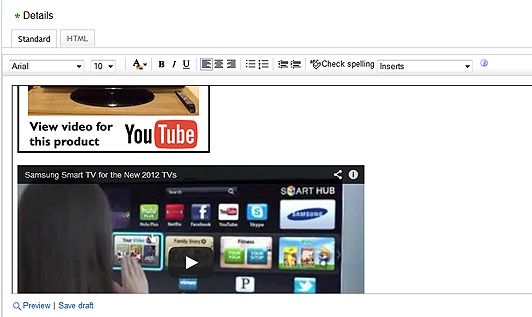 This is the HTML tag you will need for embedding images in the eBay editor. Paste in your image URL from earlier and add the height and width attributes. Add all the appropriate code to the HTML view of the eBay editor and switch to normal view to see if your image and video show up. 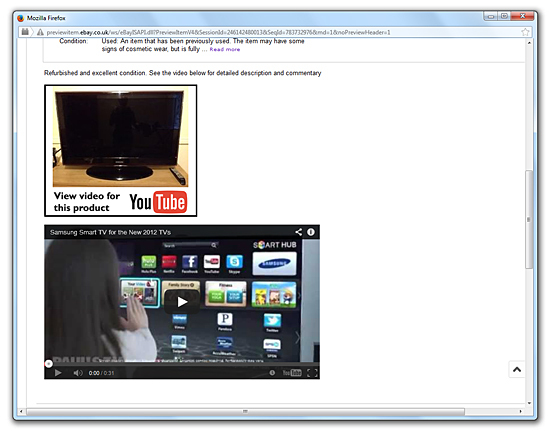 Preview the listing to see your embedded video and images show up. For more advanced HTML use something like Dreamweaver for laying out tables. This is better if you expect to be selling many of the same items. Remember, the whole point of all this is to make your product listings that little bit more interactive. It takes only minutes to bash out a quick video on some kind of smartphone and because we live in an internet age of shorter attention spans, more competition and the expectation of readily available video, it is worth doing. Twitter Mood Predicts Market Trends? Hi Darren, thanks I found this post really helpful. I found your blog whilst reviewing the camera you mentioned for Vlogging. Is it any good for this? I do not use the KU990 anymore. I’m an iPhone user now and the video camera on that is superior to any other phone I’ve had. 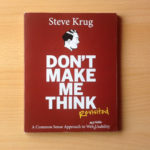 This is a great article for me. I am involved with many different internet projects including ebay and youtube and finding ways to integrate both platforms to increase my revenue is extremely useful. I will look out for more posts from you in future.